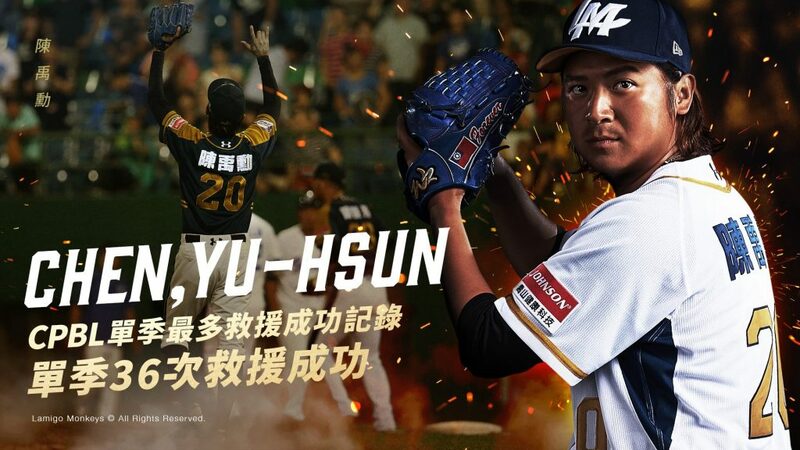 Lamigo Monkeys closer 陳禹勳 (Chen Yu-Hsun) recorded his 36th save of the season against Chinatrust Brothers and set a brand new CPBL single-season record for saves. Chen entered the game in the bottom of 9th, with 13 pitches he successfully retired the final 3 batters while striking out 2 in the process. With save number 36 in the bag, Chen has broken the record that was previously set by former teammates Miguel Mejia back in 2014. With 1 more game left in the 2017 season, Chen still have a chance to push his record to 37 saves..
“I’m definitely going to let Mejia know about this after the game. But since I don’t really speak English, I’ll probably just send the word 36 SV to him. I’m fortunate the team is in a good shape this season. If Mejia is still our closer, it’s very likely he will reach 40 saves” Said Chen Yu-Hsun after the game.